A nice original drawing signed by the football great "Jay" Berwanger. Berwanger was an American college football player born in Dubuque, Iowa. He was the first winner of the Downtown Athletic Club Trophy in 1935 (the following year the award was renamed the Heisman Trophy); the trophy is awarded annually to the nation's most outstanding college football player. 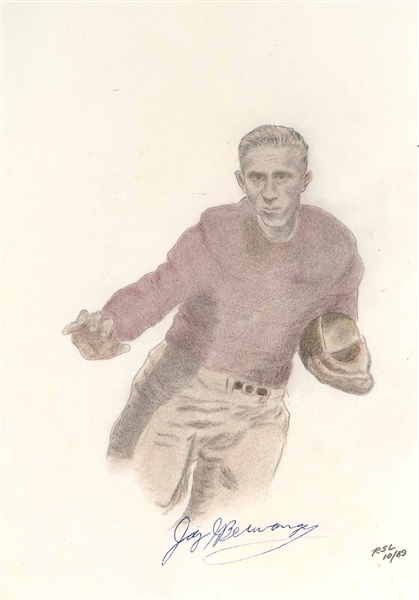 Berwanger had been a star halfback for the Chicago Maroons football team of the University of Chicago, where he was known as the "one man football team". In 1936, Berwanger became the first player to be drafted by the National Football League (NFL) in its inaugural 1936 NFL draft.8 1/2" x 11"